All transactions are safe and secure with a reliable history in online purchasing behind each of our associates. Buy the Saved by the Bell Slater Football Jersey t-shirt to own Saved by the Bell clothing and merchandise. This Saved by the Bell t-shirt is a tribute to the star of the Bayside High football team, A.C. Slater. Celebrate the jock superstar with this player jersey that will work great for an A.C. Slater costume. 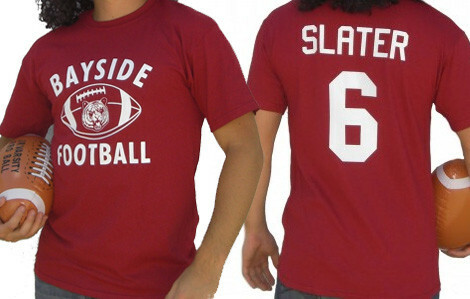 The front of this tee features a Bayside Football logo while the back displays the name and number of the school's best player. Whether you dreamed of being a football player or a track star at the Bayside Invitational, this jersey costume is a fun way to show that you're a jock too. In addition to the Saved by the Bell Slater Football Jersey tee above, browse the Saved by the Bell Clothing Gallery for more apparel like men's and women's clothes, kids shirts or hoodies.